I might as well say this right now because you’re probably thinking it anyway – my last name is McDonald and I live on a farm. Go ahead and laugh at the irony of it—you won’t be the first and you won’t be the last, I’m sure. Love Blossom Farm is my favorite place on earth even when the smell of manure drifts over from Jake Taylor’s dairy farm! It’s not a big farm—I grow numerous varieties of lettuce, herbs and as many vegetables as I can to feed my family and sell at the farmer’s market. Family is Amelia, aged almost thirteen and Billy Jr. who is almost nine. Bill senior, known as “Wild Bill” sadly died in a motorcycle accident several years ago. Somehow I’m coping even though I still miss him. Amelia has recently become glued to her cell phone (a present from her grandparents) while Billy is still a little boy—always outside and nearly always covered in dirt! My blog, The Farmer’s Daughter, has become quite popular which is a wonderful surprise. I share recipes, household tips and tales of life on a farm with two children. Ours is a relatively quiet life…at least it was until murder struck! 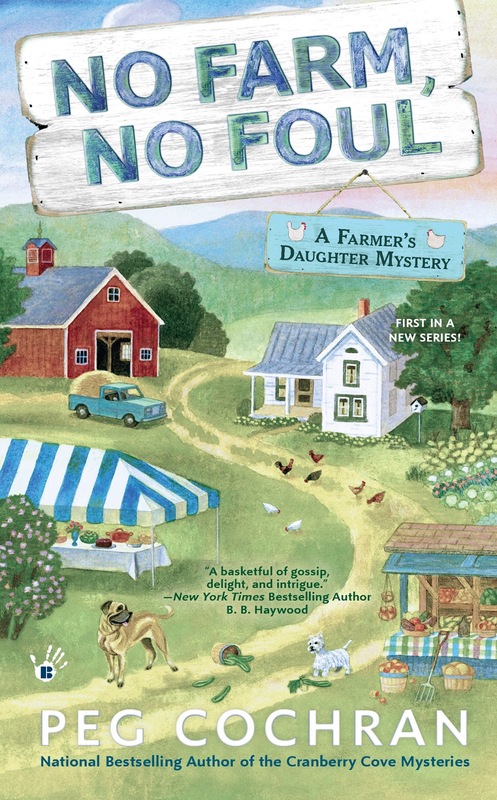 No Farm, No Foul, which is a RT Magazine TOP PICK, is book #1 in the all new Farmer’s Daughter series, and will be out on September 6 and is available for pre-order now! To celebrate the Killer Characters’ summer giveaway, I am giving away a copy of either Berried Secrets or Berry the Hatchet (your choice) from my Cranberry Cove series. Both series are new to me! I look forward to reading these. Thanks for the chance to win. Well the new Book sounds really good and I haven't read either of the two books in the giveaway...thank you for the preview and the contest. I'm always looking for new series to read. This series sounds interesting. Would love to win Berry The Hatchet. Thanks for the giveaway. You may be a McDonald and live on a farm but are you old? Thanks for the chance. Well Shelby isn't old but my children think I'm a dinosaur--they've nicknamed me Pegasaurus. LOL. Your last name matches mine. Interesting. Who doesn't love to be down on the farm. Another Cochran! I acquired the name through marriage! Love Blossom Farm sounds, well, lovely, and I know I'd enjoy your blog and your recipes. Hope you're staying cool in this heatwave! 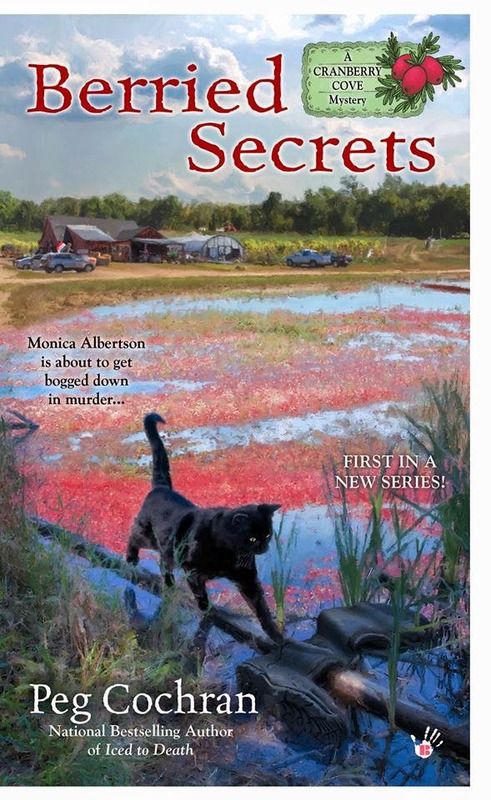 I own a copy of Berried Secrets and enjoyed it immensely. I plan to read your new farm series also. If I win I'd like "Berry the Hatchet". You have great covers!!! Do you design your own? No, my publisher has artists on staff who do the design although I do make suggestions for what I would like to see which is really fun! Thanks for another super contest. this would be a new author/series for me. Great to find a good new read. Congrats on the new series! Berries #1 is on my shelf ready to go. I'm excited my bookstore finally had it. I enjoyed the first Berry book and would love a chance to read the second. this sounds like a cute beginning to a series! Definitely one I would pick up! The new series sounds great. Thanks for the giveaway of a Cranberry Cove book. This sounds like a good series and I love to start at the beginning. Off to pre-order. Thanks for the giveaway of another of your fun books. I can't wait for cooler weather when I can curl up in a blanket on the sofa with a good book like this. Looking forward to your new series. Sounds like a fun read. Thanks for a great giveaway. I can't wait for this new series. Have an awesome day! Delightful books. This new addition should be a winner. I have heard a lot about these books! All good. I read a couple of these books and thoroughly enjoyed them. 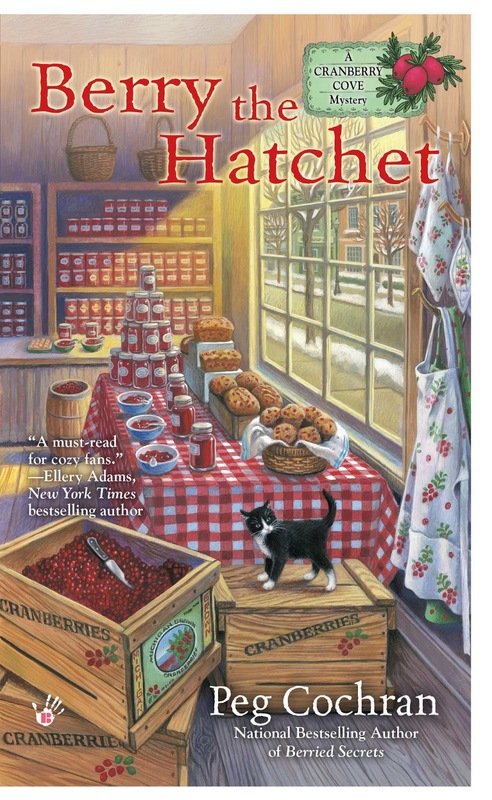 I am looking forward to the new series and would love to win Berry the Hatchet! Thanks so much for the chance to win! Sounds like great stories cannot wait to read the series. Ooooh, the new series sounds fun! I'm going to have to pre-order! My mom was raised on a farm. She has a lot of great stories to tell. Thank you for the giveaway! Congrats on the new series! I know I'm looking forward to reading it. Thank you for the chance to win. I've always wanted to live on a farm...but the work! I look forward to reading your adventures from the comfort of my semi-rural, more suburban home. I can't wait to start this series. Thanks for the chance! I love finding new series thank you. 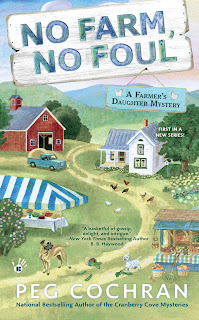 I cannot wait to read No Farm No Foul...it's on my wish list! Thanks for the chance in the give-a-way. Both look like good reads. Already have Berried Secrets but would love to read the other. Thanks for this opportunity. Our children keep saying they are helping us into the 21st century with computer stuff. This new series sounds intriguing and on my must read list. Thank you for the opportunity to enter this giveaway! I LOVE Cape Cod. It's my "spiritual" home! I absolutely love the artwork on your books, including this new series! I'm looking forward to reading them. Thanks for the great article! Thanks for the giveaway hope to read the series soon.